On Fridays and Saturdays, the fish truck comes. 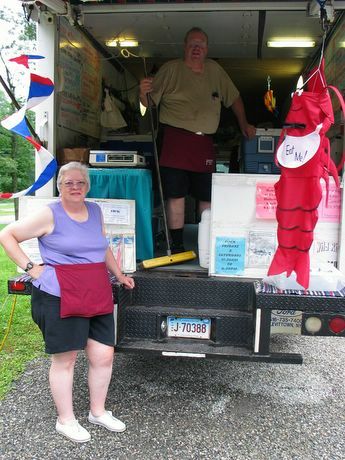 They park in the center of town for two days, and sell all kinds of fresh and frozen fish, chowder, lobster and more. My favorite is in spring when they have shad roe. I love the bluefish too, but they often sell out before I get there. So nice of them to pose for you. Did they throw in an extra bluefish? How much for 2 kilos of the red one? Mind you, I hope I'm never that hungry. Great outfit for Carnaval, though. And I hope you asked them for authorisation before the shot. Seriously, i recently came across a first for me in Lis. every morning, a woman appears in traditional Cabo Verde clothes, selling fresh (I hope) fish from plates between 2 parked cars. Has a huge clientele, but I just kept wondering how she runs her business...& that's one pic. I haven't taken here! The lobster windsock with the "eat me" bib has me in stitches! This service would go over well in many towns around here too! A good shot for a daily blog.. seems to sum up the people quite well. Nice. Is there still a fish truck in Sharon?